First some additional input on Gordon Lipe and his Release Check. Bill Kornrumpf is a Stowe Host and a member of the Schenectady Wintersports Club (SWC). He recalls that when he joined in 1967 the club had a Lipe Release Check and used it to check the members’ bindings. They found that the release values obtained on most bindings of that era were not very repetitive. However the Cubco binding proved to be the most consistent thanks to its metal-on-metal contact. Some of the other results from the SWC testing showed that the Look Nevada would let your toe move almost an inch before the binding would release while the Marker Simplex had no play before reaching its release point. That was a plus for the Look as it demonstrated the anti-shock capability that most of us liked about the binding. I know one of the things I discovered using the Release Check was how susceptible toe releases were to forward pressure. In other words a heel piece that was adjusted too far forward putting more pressure against the toe piece could drive toe release values way up! And it was very sensitive since one notch forward or back on the heel location could make the difference. This was true for the Look bindings as well as the Marker. I also heard from Peter Keelty former Product Manager for Salomon. He says that in the early 1970s they were in the thick of the ‘binding wars’ and the Lipe Release Check “became a key tool in the over-the-top claims binding companies were making.” He added that from the mid-60s to the mid-70s bindings were the most hyped piece of equipment. 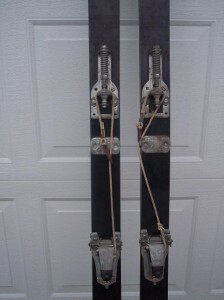 Indeed during that era Gordon Lipe had a regular column in SKIING magazine on bindings. The column included very detailed technical analysis of specific bindings and Lipe would also answer readers’ questions about bindings. You won’t find anything like that in today’s ski magazines. In his own words, Peter Keelty is a “Vermont ex-pat” and former Mount Mansfield Ski Patrol member who now resides in the Wasatch. He has an extensive resumé in the skiing world ranging from author to Director of Skiing at Park West. Local Larry Heath and Peter were fraternity brothers and have been skiing buddies since 1961. Larry occasionally clips my column out of the Reporter and mails it to Peter. Thank you, Larry! Now on to this week’s column. Again this week, I only received one correct answer to the trivia question. John Thurgood identified Dr. John Outwater, Jr. as the UVM professor who was known as the “Father of Ski Safety”. 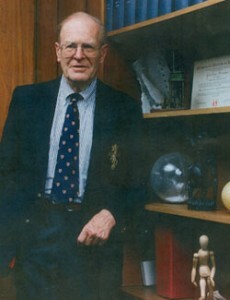 John Outwater was the prototype college professor. Born in London he had a slight English accent even after years in Vermont. He had an extensive vocabulary and knew how to use it. He could be funny, but he could also be intimidating. His curiosity extended beyond his chosen field. Which may be why he got interested in ski safety. Outwater began researching ski safety in the early 1960s. He specifically attacked the problem of broken legs and binding performance. His research would measure the torque force needed for a leg to break and then he developed tools that could be used to check a binding’s release point in the same units of force. He worked with binding manufacturers to develop bindings with consistent release values that could be set based on a person’s height and weight. 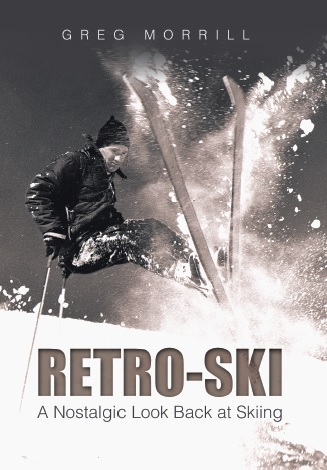 I knew John Outwater long before I became interested in skiing history. It was his love of all types of music that brought our paths together. He enjoyed listening to my barbershop quartet, maybe not as much as he liked listening to Mozart, but he found the a cappella singing intriguing. If I’d known that I’d be writing this column, I would have asked him what prompted his initial interest in ski safety. But probably it intrigued him – just like listening to four guys harmonizing.